At Some Point, the Market Will Turn Lower – Will You Be Ready? In the words of John Mellencamp, “Someday, but I don’t know when” there will likely be a significant market downturn. I won’t pretend that I can predict when this will happen with any degree of certainty. · While markets have appreciated sharply since last year’s presidential elections, there is also a lot of political uncertainty. Markets generally do not like uncertainty. However, there are many stories covering topics such as how long in the tooth the current rally is, how overvalued the markets are, and correspondingly, how a bear market may be imminent. However, it is important to recall that, oftentimes in investing, when many people believe any one thing is going to happen, the opposite occurs instead. · Pending, meaningful tax reform will benefit businesses. · The global economy is performing well as the United States, Europe, and China are simultaneously achieving strong growth for the first time since 2008. · Third-quarter results for U.S. companies are strong, with 74% exceeding analyst earnings expectations and 66% surpassing revenue expectations, of the 81% having reported, according to FactSet. · Interest rates remain low, a condition that seems likely to persist for at least the next few years. · The cyclical upswing in global profits outside our borders may have only begun as many countries follow the U.S footsteps of relative success with regard to monetary stimulus. 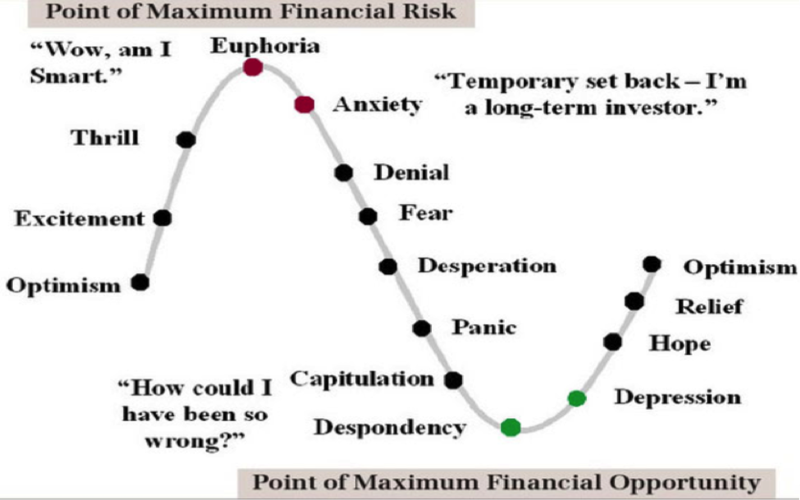 Emotions can often drive markets, as shown in the following chart, which can lead to momentum driving market valuations either higher, or lower, than the fundamentals would otherwise support as investors become either too exuberant or too despondent. In addition, while market valuations may be above average, according to research by Charles Schwab, similar valuations have produced double-digit gains over the following 12 months over the past 50 years. Of course, past performance does not guarantee future returns. Most of us know to expect a downturn at some point. At the same time, forecasting is difficult, if not impossible. The fact that the case can be made for a bull market or a bear market provides even further evidence of why forecasting is so hard. This brings us back to the original point. We know that eventually investors will face a bear market. However, we do not know when this will happen. WhenI was an analyst covering oil and gas stocks, my responsibilities included looking into my crystal ball and predicting oil and natural gas prices. When asked about my oil price outlook, I would often say something like, “It’s part of my job to forecast oil prices, so I’ll give you an answer. I also want you to know that there’s one price I know oil won’t be, and that’s whatever I tell you it will be.” I think there was one quarter (out of about 20) that my forecast was in line with the actual price. 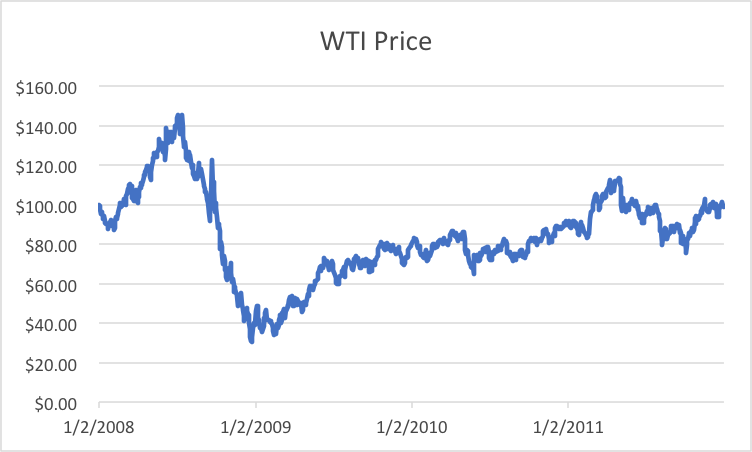 After all, no one correctly forecast the roller coaster that saw U.S. oil prices go from an all-time high of nearly $150 in July 2008 to the mid-$30s in January 2009 and then back over $100 in March 2011. Even today, it still seems hard to believe prices were that volatile. I say this even though oil prices fell sharply a second time and remain comfortably under $100. strategy, meaning it is simply not worth trying. As a result, investors are often put in a position where they must withstand meaningful declines in their current allocations and prepare themselves mentally for their portfolio’s value to fall. For example, imagine your portfolio is currently worth $500,000. A 30% decline would reduce it to $350,000. How would you react if that occurred? If you are not sure you could sit tight after such a decline, you may want to re-evaluate the risk associated with your portfolio and its ability to meet your objectives in a worst-case scenario. At Apprise, we find that focusing on your goals and your portfolio’s ability to meet them is worth the effort. Planning, scenario analysis, and risk budgeting can help place investors in the position to withstand bear markets and participate in bull markets. At the beginning of this century, the S&P 500 Index was priced at about 1,300. At the beginning of 2010, it was roughly 1,100 as investors suffered through two bear markets, one that saw stocks fall 40% and another that saw a 50% decline. Even if dividends were considered, investors had not seen much growth in value over 10 years. However, if you continued to hold for the next seven years, your assets would have doubled to over 2,400. That is before taking dividends into account. While history shows time can be your greatest ally if you do not sell when asset prices fall, it is hard to think that way when you are scared and in the middle of a bear market. As a result, it is important to make sure you hold assets that are likely to be impacted less by the market’s whims, which can make it easier to ride out the market’s decline and participate in any future recovery. Please keep in mind that past performance does not guarantee future results. What might happen next time is truly unknowable. If you have a financial plan in place, you should review it to better understand how it could be impacted by less-than-stellar market returns. This should help prepare you for weaker returns, should they happen. If returns exceed expectations, you will be over funded and over-prepared, which is not necessarily a bad outcome. If you have not checked your portfolio’s asset allocation in a while, it could be an appropriate time to review it. For example, according to this Morningstar commentary, the current allocation of a portfolio that was 60% equities/40% bonds when the market rally commenced in March 2009 would be 83%/17% if none of the positions had been adjusted higher or lower over the eight-plus year holding period. Rebalancing can also help reduce portfolio risk as well as make it easier to accomplish other goals such as meeting retirement cash-flow needs, completing required minimum distributions, and making charitable donations. If you do not currently have a financial plan and are interested in creating one as well as taking an approach to investing that helps to eliminate the stress and costs that come with following your portfolio appeals to you, please fill out our contact form, and we will be in touch.